Berlin 2018 was my 18th marathon and my 3rd Berlin. 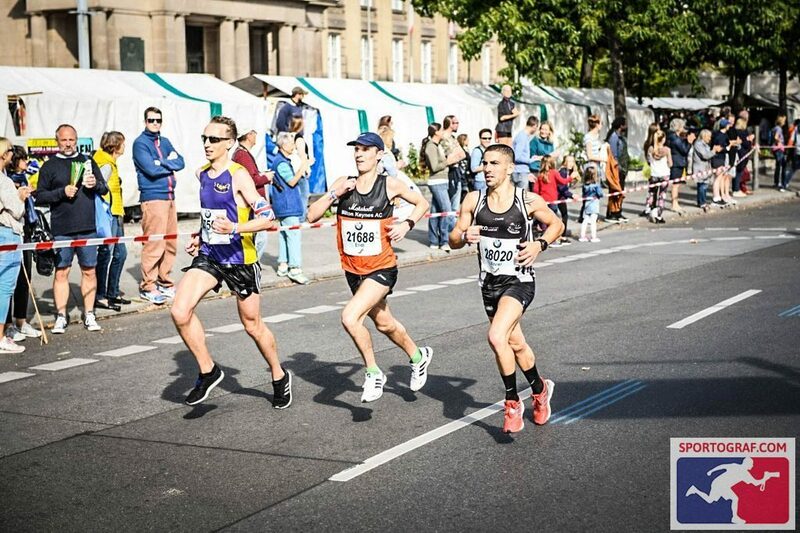 Germany’s capital has been kind to me down the years, in both 2013 and 2015 I ran PB’s there and my 2015 time of 2:33:35 broke a long standing club record, only for Elliot to take it off me shortly after by a handful of seconds! He subsequently improved it to 2:32:35, exactly a minute ahead of my time. Following that 2015 run I was convinced I had more in me but then in 2016 and 2017, nothing happened to suggest that I did. 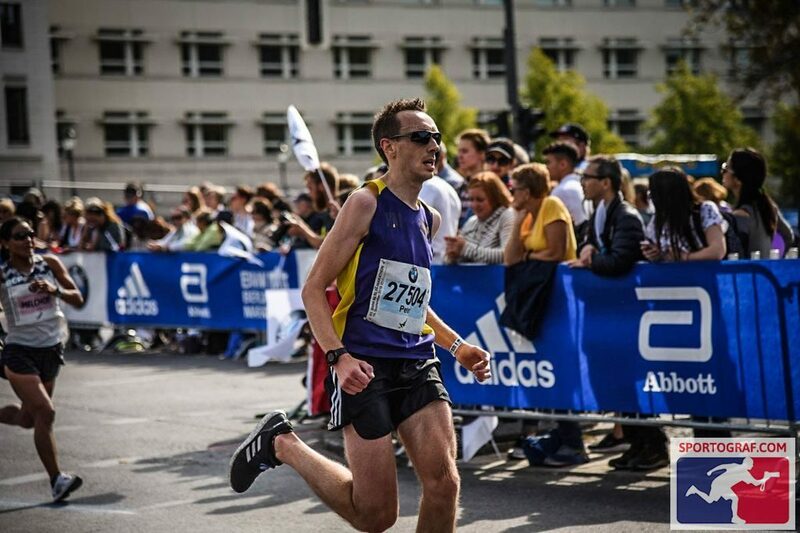 Regular niggles meant I went into marathons not fully prepared and at one stage I completely missed seven months due to a combination of injury, studying, and a bit of loss of love for the sport. I began to think I was ‘past it’. The problem is, I’m stubborn and I like proving myself wrong. I entered 2018 with a new determination and as the year has progressed I’ve got stronger and stronger, beating my 5k and 10k PB’s. I was running consistently high mileage, staying on top of injuries and generally recovering well and feeling fresh. 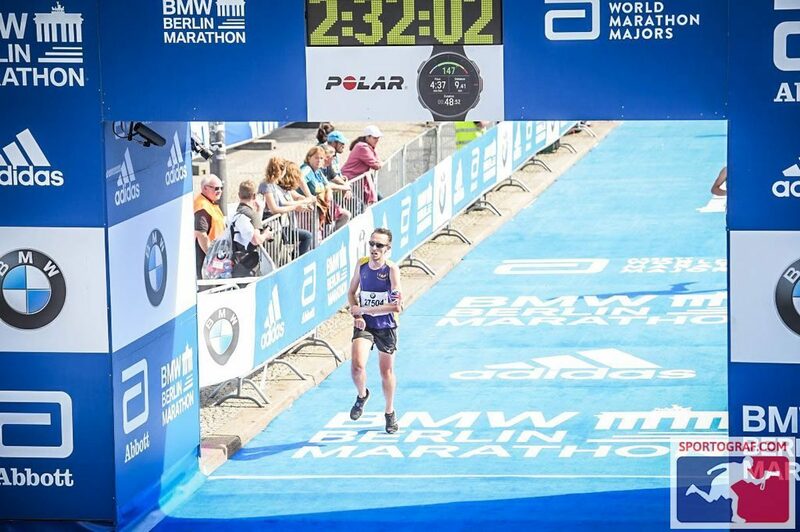 At the Manchester Marathon in April I deliberately pushed myself by starting at 2:32 pace, even though I knew I wasn’t in the shape to sustain it. I had to get used to the pace, to see how far I could get and to make myself suffer at the back end. I was delighted to still run 2:36 but it was all about Berlin, everything in 2018 has been about Berlin. Berlin 2018 coincided with a friend’s (Wendy Webber) landmark birthday (I’ll let you guess which landmark) which meant there was a good contingent from LBAC and MMKAC for the running and partying. I think Wendy aside, the others would be the first to say they weren’t too happy with their performances. Buy them a drink and I’m sure they’ll tell you their own stories. Marathons can go wrong even for the fully prepared so going into them in less than ideal condition can really bite you. They’ll all come back stronger, I’m sure. My aim of running 2:32 meant hitting each 5k in exactly 18 minutes. Settling into a race is always the hardest part and at first I thought it was too warm to run quick. But once through that first 5k I relaxed and the heat didn’t really bother me. After that there’s not a lot I can say, I kept ticking off the 5k splits and I reached half way slightly up on target (1:15:37). Shortly afterwards I passed Elliot who had accepted it wasn’t to be his day after his injury-hit build up and with his words of encouragement in my ears I pressed on. To my amazement I kept hitting each 5k marker slightly ahead of target. To say I felt ‘good ‘ would be misleading, but let’s say I didn’t feel bad. I felt as good as I’d ever felt that deep into a marathon and I felt like I could keep pushing rather than just surviving. The 35-40k stretch is the key one, if you hit 40k on target you can always find something to get you to the finish line. I did lose a bit of time in this section but the time gained earlier meant I was still on target at 40k. I pushed on and as I approached the finish I passed under the Brandenburg Gate and looked up to see the finish line clock showing 2:31:30. I sprinted like crazy to try and get under 2:32 which I just managed on chip time (2:31:57) if not quite on gun time for the finish photo. I’m not one for big celebrations but I was rewarded with one of the most amazing feelings of contentment I could ever wish for. I love Berlin, both the city and the marathon, no doubt I will be back at some stage. It should always be your first choice if you’re obsessed with times, like me. I’m reluctant to speculate what might still be possible because I did that three years ago and look what happened. You can’t plan too far ahead in this sport. Sub-2:30 has never been a realistic consideration and I can’t believe that someone like me could achieve it, plus I’m not getting any younger. The problem is, I’m stubborn and I like proving myself wrong. Thanks to everyone for your support both on the roadside and back home, it means a lot. Thanks in particular to those who looked after me after the marathon, you know who you are.